RonDoids: FBI mum about sudden closing of solar observatory. CONSPIRACY THEORIES FILL THE SILENCE! 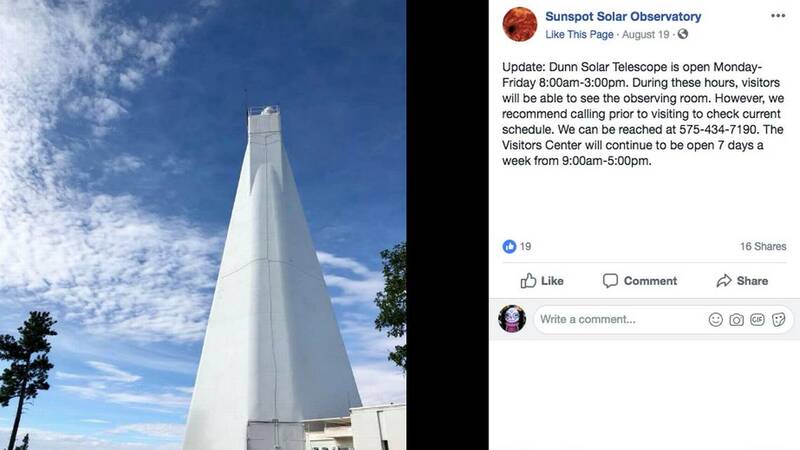 FBI mum about sudden closing of solar observatory. CONSPIRACY THEORIES FILL THE SILENCE! “There was a Blackhawk helicopter, a bunch of people around antennas and work crews on towers, but nobody would tell us anything,” House said, according to the newspaper, which reported the observatory entrance was marked off with yellow crime scene tape on Friday. Meanwhile, people from all over the country are trying to guess what’s going on. The default position: This has something to do with aliens. CNET noted that the U.S. military built the observatory in 1947, “when it realized the sun could interfere with radio communications. The National Science Foundation ran the facility from the 1960s until this year, when operation was transferred to AURA and New Mexico State University. “Hopefully it isn’t now in the process of being unwillfully transferred to aliens or foreign spies,” CNET writes. Commenters on the observatory’s Facebook page ran with the alien theory, too. “When the aliens invade we have nowhere to evacuate to anyway; the truth will be our destiny,” wrote Gene Alexander, one of dozens who have commented on Facebook. “Something was spotted. And we’re not being told,” wrote a man named Eddie Barnhill. John Pleites-Sandoval offered a more involved theory: “Maybe a celestial body that we have not encountered in a long while for thousands of years is finally making its way back into our solar system,” he wrote on Facebook. It's late at night in the Southwest & I am ready to find out what the hell is going on with the mysteriously evacuated National Solar Observatory in the New Mexico mountains. The closure freaked out the folks at Gizmodo tech website, too. “This is how it happens when extraterrestrials make contact with Earth,” writes senior editor and reporter Jennings Brown. “It starts with a newspaper report about suspicious activity at a space research facility — government agents and military vehicles. The local sheriff gets angry and confused.